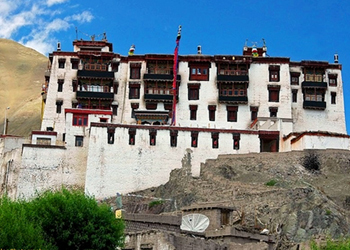 Stok Monastery, known as one of the most famous Gompas of Leh, is just 15 km away from the main city which used to be the royal residence. Stok Gompa belongs to yellow – hat sect of Buddhism. The entrance veranda has beautiful mural paintings of the guardians of the four directions. The main assembly hall is decorated with thangkas and banners. One of the large halls in the palace is converted into Museum, which has a wonderful collection of Thangkas, royal crowns, dresses, coins, antique ritual objects, ceremonial sword, precious stones and traditional head dresses worn by Ladakhi women. The courtyard at Stok Gompa consists of a large number of prayer wheels. Situated above Stok Palace; it was founded in 14th century. Its walls are decorated with images of Tara (the Saviouress), Vajrapani, Sakyamuni (Buddha), Nangyamal and Amchi (Medicinal Buddha) and Avalokitesvara (with 1000 hands and 11 heads in the painting). This monastery is famous for its big library. The library has a complete set of the Kandshur, the 108 volumes of the Buddha’s teachings. There is a Chapel inside the monastery which is the oldest in entire Ladakh. Stok Monastry attracts thousands of people each year in its famous Guru – Tse – Chu Festival. Dance, music and festive foods make the celebration a memorable event.